A hidden microphone was found in Ecuador's embassy in London, where WikiLeaks founder Julian Assange is sheltering from extradition to Sweden, The Ecuadorean Foreign Minister Ricardo Patino claimed. The microphone was found in the office of the ambassador Ana Alban and was discovered last month during his visit to Britain to discuss issues surrounding Julian Assange. At a press conference in Quito, the foreign minister of Ecuador, held up a photo of a "spy microphone" that was found on June 14 inside a small white box that was placed in an electrical outlet behind a bookshelf. 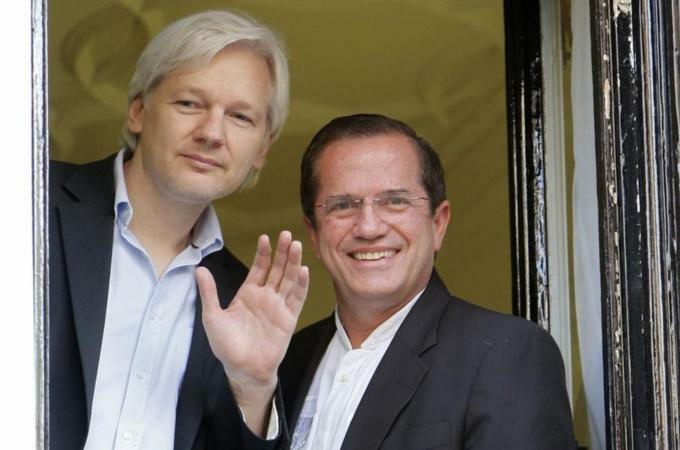 However, the purpose of the bug, according to Patino, was not to track the WikiLeaks founder directly, but rather listen to the conversations of ambassador Ana Alban. He told reporters: "We have reason to believe that the bugging was carried out by The Surveillance Group Limited, one of the largest private investigation and covert surveillance companies in the United Kingdom." "We found something, but we don't know what it is, and we are sending it to someone who can respond to what it is about... I don't know how long it has been there,"
The foreign minister said Ecuador was going to ask the British government to help investigate the alleged incident, adding that the system worked with a Sim card and could be activated by a call from any cellular or fixed-line phone. He said some had a text facility that sent alerts when people were speaking in the room so that users could call to listen in. The Surveillance Group website states, "The Surveillance Group do not and have never been engaged in any activities of this nature. We have not been contacted by any member of the Ecuadorean government and our first notification about this incident was via the press this morning. This is a wholly untrue assertion." Wikileaks are attempting to assist Snowden, who is believed to be stranded at a Moscow airport and is seeking asylum in over 20 countries including Ecuador. Snowden is wanted by the United States on charges of espionage for revealing a massive phone and Internet surveillance programme.